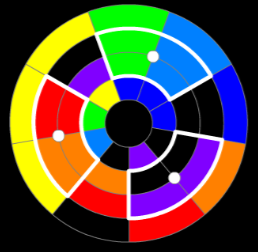 This week, I have chosen the game Pinwheels... Pinwheels is a puzzle game where your goal is to make the colored sections on your wheel be located in the same position as the colored sections on the target pinwheel... You can move these sections via things called control points, they are pieces of your wheel that, once clicked, rotate all twelve sections around it one spot clockwise. This weeks challenge is to finish the hardest level as fast as you can. If no one manages to complete it we will move down to the second hardest, if no one completes that we shall go one lower..etc... So try to complete the hardest level you can. Good Luck Everyone and Have Fun!